A Mindful Mother read about the GleanSLO program in one of our recent newsletters. 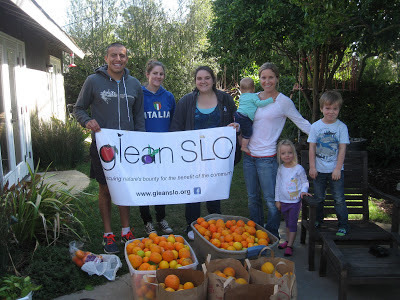 She called GleanSLO, and they arranged to pick the excess fruit from her orange trees, with the help of her children. This lead to an idea for Mindful Mothers: canvasing our neighborhoods looking for full fruit trees, and passing out fliers about GleanSLO. As luck would have it, GleanSLO was planning it’s first ever "Neighborhood Citrus Collection Day" for Saturday, March 2! Three Mindful Moms walked their neighborhoods with their kids, passing out fliers about this special day. We met some very nice neighbors, and the kids enjoyed being out on a beautiful day, for a cause they could understand and believe in. In all, 1,463 pounds of citrus were collected!! Thanks to Molly Trapp and Erin Augustine for getting this ball rolling!